. استمتع بالخدمات الراقية والضيافة التي لا مثيل لها بهذا الفندق في جزر ياساوا. يقدم هذا الفندق العديد من الخدمات الكفيلة بإرضاء أكثر الضيوف تطلباً. بالإضافة لهذا,تتضمن كل غرف الضيوف مجموعة واسعة من وسائل الراحة . بعض الغرف توفر حتى إغلاق, مناشف, صوفا, مرآة, بياضات لإرضاء أكثر الضيوف تطلباً. يقدم الفندق خدمات رائعة كمثل حوض استحمام ساخن, شاطئ خاص, حمام سباحة خارجي, غوص, صيد السمك لمساعدتك على الاسترخاء بعد نهار طويل من النشاط والتجوال في المدينة. إن Navutu Stars Resort هو مكان مثالي للمسافرين الذين يتطلعون إلى الراحة والاستجمام في جزر ياساوا. very private resort with only few bure's. you get all attention of the great stuff. a lot of different options for attractions. food is great and made per your request. kayaks or paddle boards are free to use. Spa service is awesome. The staff Made our stay unforgetable! Eating lobstet everyday was a big plus :) of course more choice was available! It is a really peaceful resort and I hope they keep it this way! Hospitality of staff at Navutu Stars is amazing. We felt like part of their family and have never felt so sad to leave a place. I left behind my headphones on the boat and they were kind enough to assist me with getting them back at no charge. Cocktails and food were great. Cleanliness of rooms were top notch especially amazing as rooms are located on a beach. We appreciated the activities arranged each day. Would advise anyone travelling here to bring their own water as water is expensive on the island and it’s not recommended to drink tap water. Also insect repellent is a must as there are lots of mosquitoes around. We will definitely return here one day. The resort completely lacks Fijian hospitality to make you feel like one of their own as in other places generally. Most things in the resort are overpriced and not too great. Food was average mostly except a few very good dishes. The rooms are the only nice part of the resort. A beautiful resort with lovely staff who go the extra mile to make you feel relaxed and welcome. This was our second stay and we hope to return again for our next special occasion. Everything was wonderful and they catered for my coeliac disease requirements (gluten free) exceptionally well with pasta/breads/muffins/pancakes I could eat alongside the fresh produce. The island is stunning and the staff super friendly and made us feel very special. We had such a lovely relaxing time. Lovely sunshine Very very kindly staffs like family members. Fine dinning with good quality ingredints. If you choose Navutu, don't worry just enjoy your holidays. Amazing holiday! It's quite far from the mainland but totally worth it! We took helicopter out and seaplane back which all added to the experience. We stayed in a beach bure! There are only 10 bures in total so it's a really peaceful resort! Free activities like kayak paddle board snorkeling and village tour etc! And you can pay to do different tours which are good value for money! Staff were so lovely and you are right on the beach and there is a reef right on the resort for snorkeling! Only downside was the mosquitos... I'm prone to getting bites anyway but take repellent and itch relief cream! 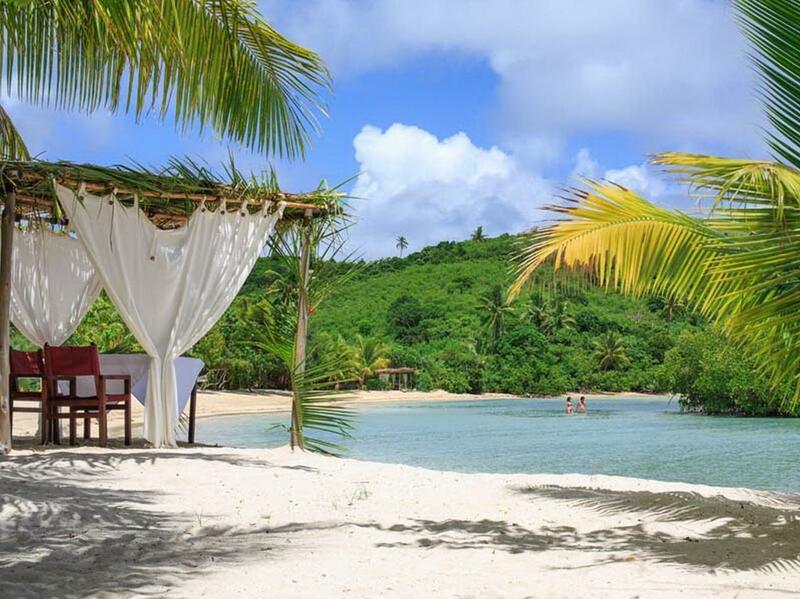 Navutu Stars is a secluded and upscale resort that is perfect for couples. They don't allow young children so it feels more luxurious and relaxing than the family resorts. The burres are spacious and clean. The food and drinks are delicious, and the meal plans give you more than enough food. There are three activities scheduled each day. Usually one of them is free and the other two are between F$40-60, although trips to the caves are F$120. These prices are inclusive of the 25% government tax though so it's not as costly and marked up as it may at first seem. The staff are so friendly, and they go out of their way to make sure you have a good time. We definitely loved our stay here! Navutu was a gorgeous slice of Fijian life tucked away in the Yasawa chain. We were immediately immersed in the island when we arrived, greeted with a welcome song and drink. The staff is extremely friendly, always greeting you on a first name basis. Since there are only ten bures, Navutu feels very private. The garden bure was spacious, comfortable, and literally steps away from the beach. There is no air conditioning, so the humidity could be a little heavy, but the large ceiling fans were helpful at cooling the bure. The food was generally good, and when in doubt, go with a seafood option, as it was all fresh and delicious. If given the option, participate in the traditional Lovo dinner! Daily snorkeling trips were a great way to explore the surrounding area, and we also took advantage of the kayaks and paddle boards. only 10 houses in the Navutu island. we visit the local house with the hotel tour guide. we have private beach in the island and make friends with the hotel employees and other guests. the food in the resort is perfect. Staff are very friendly and property is extremely relaxing. Very nice personal touches and enough variety of activities stay active during the day before unwinding at night. Family like resort with maximum of 20 guests on a beautiful small island and the most welcoming Fijian staff. Cosy and clean bures with beach front sunbeds and hammocks, tasty food and organized daily activities. Staff are amazing. The rooms are amazing. It is very quiet and often you could easily think you were the only one in the resort. If you want adventure, make sure you go on the excursions each day. Kayaking , paddle boarding and snorkelling are great free activities. Wir haben die drei Nächte hier sehr genossen. Rückblickend noch mehr, nachdem wir in anderen Redorts waren. Sehr sehr gutes Essen, ein riesiger Bungalow direkt am Meer mit Hängematte und Liegestühlen. Kajak u StandUp Paddles sind frei zu entnehmen. Waren mit einem Hotelguide Sonntags in der Kirche - sehr authentisch! Die Massage ist ebenfalls zu empfehlen. Wir würden sofort wiederkommen, wenn die Anreise nicht so lange wäre :-)) Für Fiji Verhältnisse - Top Preis Leistung!!! Loved our Bure and the staff were wonderful. Just found the food and wine very expensive and no snorkling off the beach. We chose this resort over others in the Yasawas because it is small, there are no day-trippers and children under 12 are not accepted. We were very happy with our choice. Our garden bure was spacious, quiet, very private and only steps from the beach. We took the half-board meal package which included a cooked breakfast, 3-course dinner and a cocktail. This was plenty of food for us and it was very good. The staff were lovely - very friendly and accommodating. Nothing was too much trouble for them and they made our stay special. Morning yoga looking out to sea was a great way to start the day. The only downside is the cost which is high but that seems to apply to most Yasawa resorts. This is a nice place, with amazing staff ready to help and entertain you. The kitchen is good, and the bures well appointed. There are a number of activities you can opt for. But... at this price one would expect also a gorgeous beach, and one we can enjoy or a nice, relaxing time on the hammock provided. Unfortunately, the resort is located on beaches where the sea recedes right after noon and leaves a vast patch of silt-covered swamp. The consequence is that if you try to stay on the beach or the hammock, you will be devoured by mosquitoes and they will make you retreat inside, which is not exactly my idea of a South Pacific vacation... it’s a shame because other than its unlucky location the resort is nice, but I suppose it depends what people value most..
As seasoned Fijian travellers we were delighted with the entire experience. The location is superb, the staff exude true natural Fijian friendliness, the Beach Bures are spacious with fabulous views and the food is excellent, if a bit over generous. Perfect for couples from honeymooners to olderweds of any age. Excellent service and resort! By far, the friendliest resort I have every stayed at. Everyone was so friendly and genuine you feel like part of the family. Waking up to yoga at the sunset deck, serenaded by guitar at breakfast every morning. Then off to the very well planned daily activities (you never feel like you have nothing to do which I particularly enjoyed), followed by a delicious dinner (thanks chef) every night. Did not even need to read my book. Also, greatly appreciated the unbeatable complimentary gems offered by the resort! Picnic at a private island, private dinner and snorkelling trips really made a difference to our 5 star experience. Vinaka Jeremy and Team!